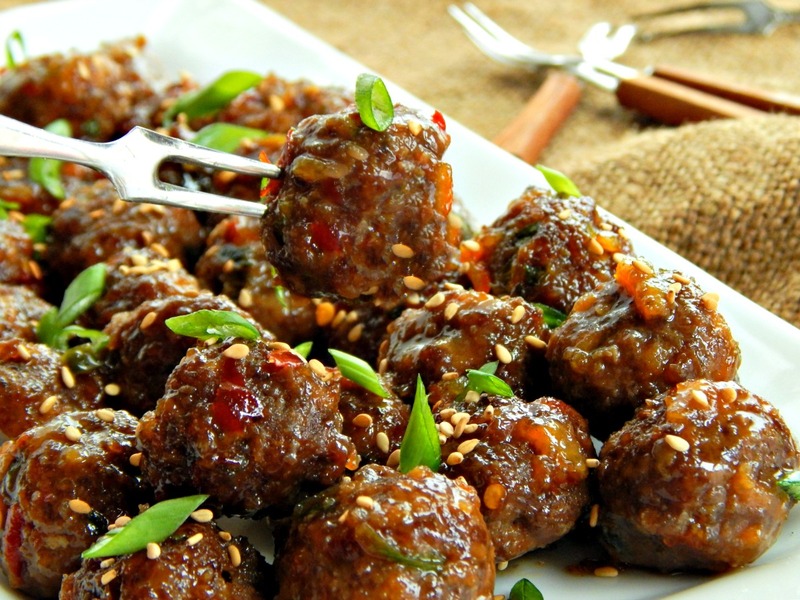 These pretty little meatballs with a bit of a Korean kick & a sweet/spicy glaze are just fun, fun, fun. They’d also be great for game day or an appetizer at any party – but can I just mention Super Bowl?! It’s coming right up and you’ll want Spicy Korean Meatballs. Even if you don’t know you do, yet, you’re gonna want them! And not just for your Superbowl Party – once you make them you’re gonna want them all the time! Spicy Korean Meatballs really are crave-worthy, from the packed with flavor (don’t worry, they aren’t too hot) luscious little meatball to the gorgeous sticky sweet sauce enveloping them. When I say crave-worthy, I mean crave-worthy. The recipe makes about 50 small, one inch meatballs and I served them to my fave octogenarians one afternoon (my folks) and between the three of us, we just about decimated them. The leftovers we refrigerated but they were all but gone in no time because every time someone opened the door, another one disappeared, cold from the fridge. I like quite a bit of spice, my Da, he likes things with “personality” as he calls it, and Pat likes a little, rolls with the punches, but she’s a 92 year born in Chicago and living in South Dakota. And all three of us loved these! So they aren’t knock your socks off spicy, but Spicy Korean Meatballs have flavor for days and enough spice to make them interesting. And let’s not even talk about that sticky sweet glaze! We’ll be here all night! I think these are gonna be a crowd pleaser, for sure. And they should go further at a party then they did at our house, especially if you’re just not falling on a plate of them like hungry wolves, and especially if you’re serving other items! That being said, if you are serving a crowd, double or triple the recipe! I know so many of us are always pressed for time and buy the frozen meatballs at the store. Been there, done that, and I still do sometimes, and they’re always good, right? Maybe just not great. And you can shortcut this recipe with the frozen meatballs and just use the glaze if you want, but take a few minutes to mix up your ground beef and you’ll never go back. It’s no more difficult – well it’s actually easier – than most meatloaf recipes and it gives you the opportunity to infuse those Asian flavors right into a luscious little meatball that’s out of this world delish! If you don’t have/can’t get all of the ingredients, play around a bit. A teaspoon or two of Sriracha or a little Sambal Oelek or even a teaspoon of Red Pepper Flakes can replace the Gochujang, for instance. You can mix up the meatballs, take a smidge and fry it up to give it a taste test, then adjust. Don’t sweat the glaze, either. I used orange marmalade, but apricot or plum jelly or jam would be great, too. Just use something you like so you aren’t stuck with half a jar of something you won’t eat in the fridge. Scoops portion perfectly, maximize your time and help avoid a big mess. When we’re talking frozen meatballs at the store, they’re an item that is usually measured in ounces on the package rather than by the pound. There’s a reason for that. The producers know that if the package was labeled in pounds, we consumers (hate that word, consumers – we’re people!!) will be more likely to compare the cost of the meatballs to the cost of ground beef, which IS sold by the pound. It makes comparisons harder to do, also. Bottom line? We’re more likely to buy those frozen meatballs even though we might be paying two or three times or more than if we make our own. Let’s go through the math. Just at random, I picked 22 ounces of Simek’s Frozen Meatballs at Target for $6.99. Divide the cost $6.99 by the amount 22 ounces. That’s your price per ounce. Multiply the ounces by 16 since there are 16 ounces in a pound and you’ll get your price per pound. $6.99 divided by 22 equals 32 cents, multiplied by 16 equals $5.08 a pound. It does sound pricier by the pound, doesn’t it? Let’s look at the math another way. If you bought sales priced ground beef and made a basic meatball in the size of Simek’s with a scoop, it would cost around $1.79 and take about 25 minutes (15 is the baking time). $6.99 minus $1.70 is $5.29. You just got “paid” $12.70 an hour in savings and 15 minutes was the baking time. If you count the time to mix, form and pull them from the oven only, you just got “paid” $31.74 an hour. These meatballs are a little pricier and take a bit more effort, though, because they have additional ingredients. Make sure to buy your ground beef on sale, and buy extra when it’s on sale, so you’ll have it on hand at the lowest price. Shop at an Asian market for the best prices on the imported ingredients if you have one nearby, or stock up around the Lunar New Year (which changes every year) where you’ll often see sales prices (many unadvertised) for Asian ingredients. Don’t be afraid to buy the Gochuchang, it is a fermented paste and just like pickles keeps about forever in the fridge. Line a large baking sheet with aluminum foil. Gently mix all ingredients except for the sesame seeds and a few green onions set aside for garnish in a large bowl. Using a scoop form into 1″ balls. With slightly wet hands, shape each into a ball shape and place on a baking sheet. Bake 15 to 20 minutes until cooked through, no longer pink in the center and lightly browned. Toss in glaze, recipe below, then sprinkle with sesame seeds and green onion for garnish. Place all ingredients in small saucepan. Stir and heat until bubbly and slightly thickened. The glaze will continue to thicken as it cools. I’ll be bringing Spicy Korean Meatballs over to Angie’s Fiesta Friday #157, cohosted this week by Andrea @ Cooking with a Wallflower and Su @ Su’s Healthy Living. Thanks, ladies, for making this link party possible! This entry was posted in Click here for Fabulous Food Posts and tagged Appetizer, Asian, Easy Recipe, Frugal Hausfrau, gochuchang, Ground Beef, Hot Peppers, Korean, Meatballs. Bookmark the permalink. Can I use something other than the gooch sauce I cant find it anywhere! Hi Heather, sorry not to get to you sooner, I know not everyone can get it so I have some options in the narrative. it says above A teaspoon or two of Sriracha or a little Sambal Oelek or even a teaspoon of Red Pepper Flakes can replace the Gochujang, for instance. You can mix up the meatballs, take a smidge and fry it up to give it a taste test, then adjust! Hope that helps! Molly, I was drooling just looking at the picture even though I do not eat beef! I guess it can be made with turkey or chicken. Love your money saving tips. Thank you for sharing your recipe here at FF! I think either turkey or chicken would be very good, maybe even better! Recently bought gochujang so your recipe is welcomed. Sounds great. Isn’t it funny how that happens sometimes? You buy something and then see recipes everywhere…. :) I’m looking for more now to use mine up! We don’t watch much football here, but I DO really like the munchies and the commercials…I’ve been off my feet for a couple of days, something happened to my leg and the Doc said keep it elevated and iced, so I’m not sure WHAT I’ll be doing. Probably sneaking in to watch the tv and then being scolded and sent back to bed by the folks, lol! Happy Super Bowl Party to me! These look amazing. Thanks!! This would be great for a cold. And delicious. Win win. I bet they would! I love spicy foods when I have a cold…I swear all that spice helps knock it down! Especially the sinuses. The colds round here won’t quit! A friend who works in the medical field told me the hospitals here are full with flu patients. We’ve been lucky, but my hands are just about chapped with all the hand washing & sanitizer I’ve been using!! It’s been a bit much! I’ve nominated you and your beautiful blog for the Blogger Recognition Award. I love your blog! What a perfect idea!!! These look so good and sound amazing! Now if only we could get an Asian market in my small midwestern town. I know! We’re lucky our store in SD where my folks live stocks a few items. But then we’re like 1/2 an hours drive into Sioux Falls, so we can get more things there – and my step sister in law (does that sound complicated, lol?) visited with the rest of that side of the family and she’s from China, now in California, so we checked out a little Asian market here. She said not the best, but I was able to pick up some basics! It was amazing going with her! Love, love, love your recipe. I used to make similar ones way back in the days of “mass” entertainment (job connected) meatballs on sticks were one of the “in” food then 😄😄, but now I can not wait to try out yours. Only one little problem, can not buy 1/4 cow!!! I remember my Mom used to put out some kind of little cocktail meatballs, she called them! You’ve had amazing trav els and I know you’re quite an elegant entertainer!! The meatballs look so tasty and I love the glaze. You are absolutely right! Plus you get to buy from someone you know! !